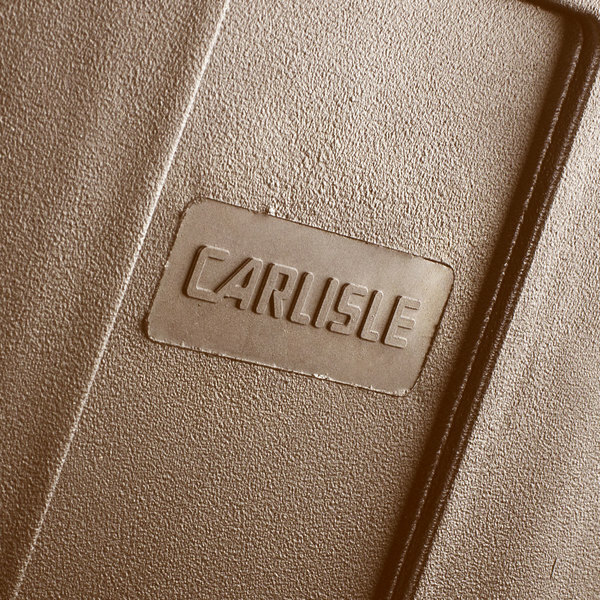 Ensure your food is kept at the ideal serving temperatures with the Carlisle PC300N01 Cateraide brown food pan carrier. 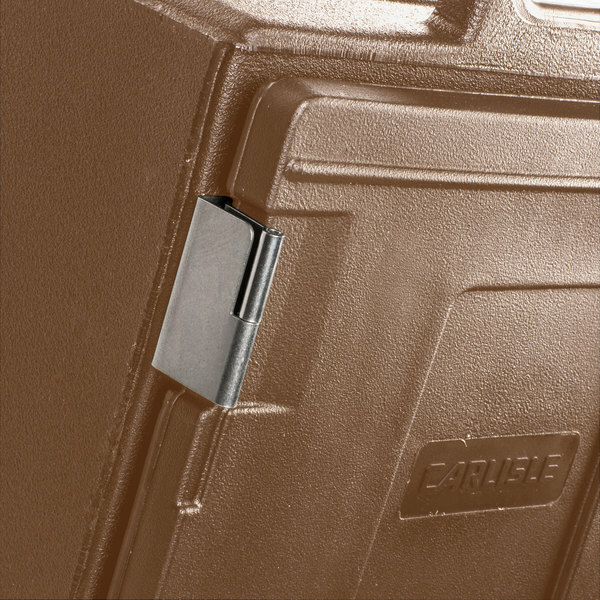 Keep your hot or cold food at safe serving temperatures for hours at a time during catered events and parties. This pan carrier can be used for anything from hot entrees to cold salads and desserts. 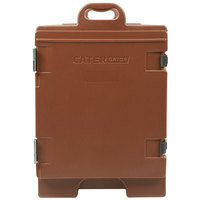 It has sturdy handles for transport and is made to stand up to frequent use in your catering business. 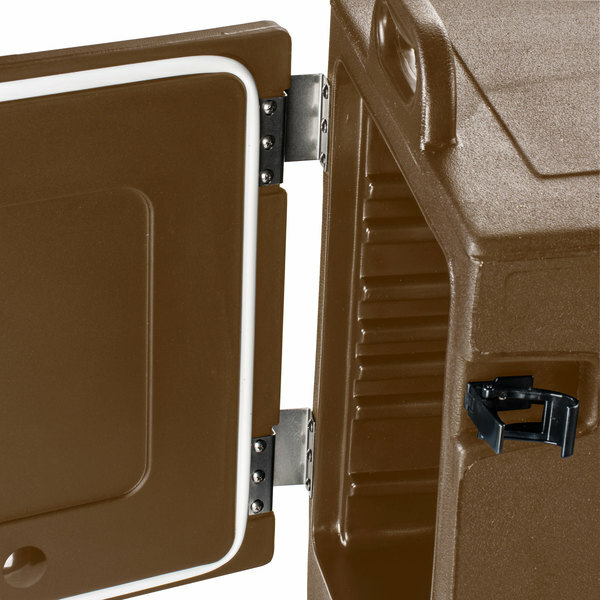 "Great product to transport food in and when I was ready the food was still hot. I really enjoyed this product and will buy another one soon since business has increased." This pan carrier is made from heavy-duty, easy-to-clean polyethylene and is designed to maintain the temperature of your food while resisting heat up to 200 degrees Fahrenheit. 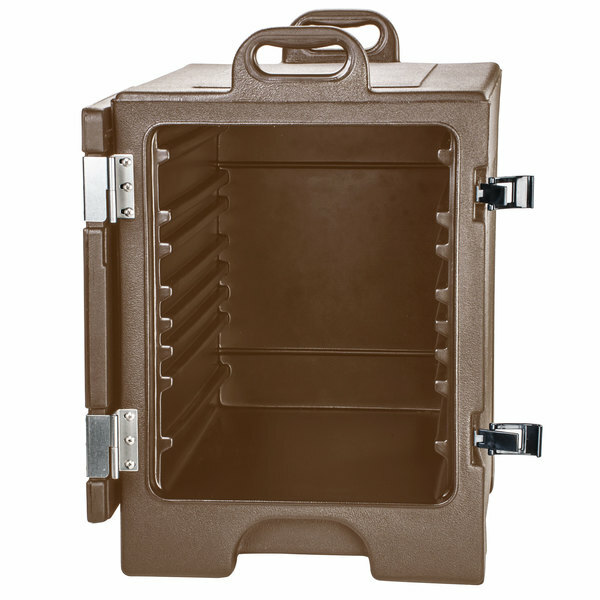 Inside, this food pan carrier has end-load tracks that can hold combinations of 2 1/2", 4", or 6" deep food pans for optimum convenience and versatility. 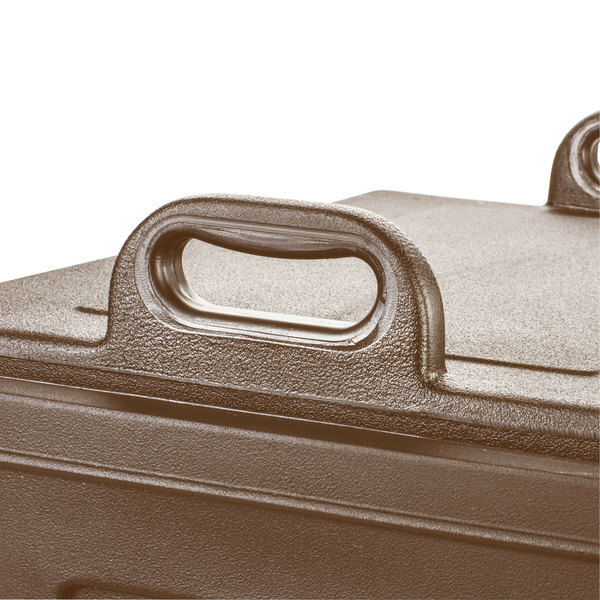 Thanks to its sturdy exterior handles, this food pan carrier is easy to move around your kitchen, between catering venues, and also around serving areas. Don't forget to consider adding an insulated food pan carrier cold pack into the mix to keep your cold food, colder, longer! That's right - this food pan carrier is great for use with hot or cold food. The cold pack (sold separately) slides into the carrier just like a 2 1/2" deep food pan, and takes up the same amount of space. 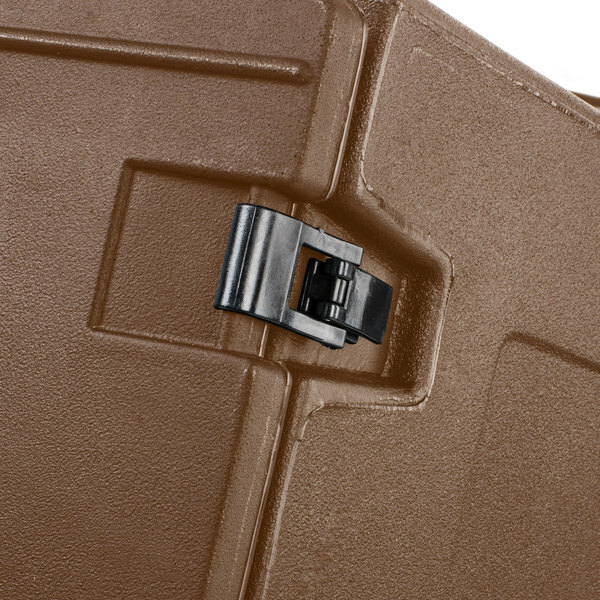 What combinations of food pan depths can this carrier hold? 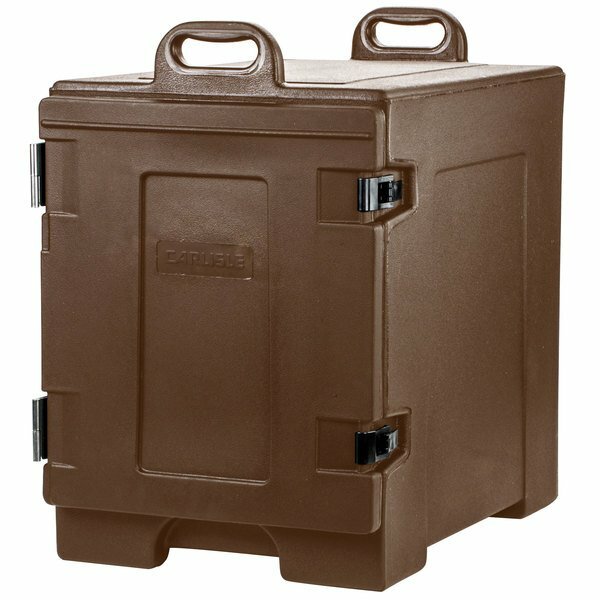 Which food pan carriers can be stacked with this item? 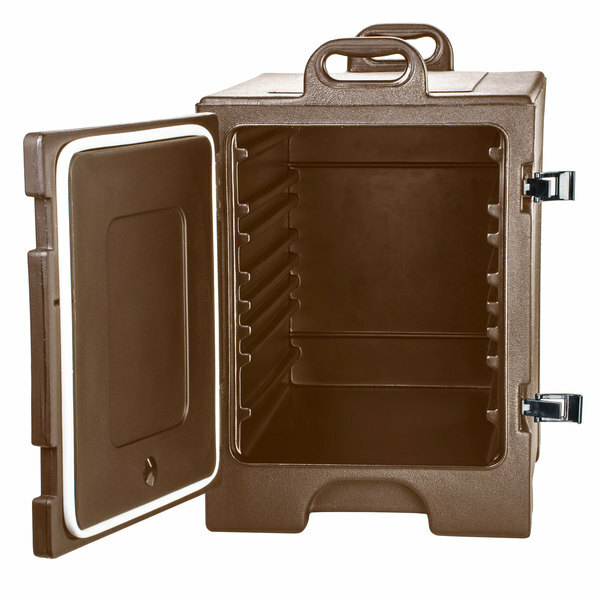 CaterGator 215PANCAR, Cambro 300MPC, and Carlisle PC300N food pan carriers can be stacked interchangeably with each other in at least one way. Love this item! It worked really well and kept food piping hot for well over the 6 hours. I did pre-warm the unit by dumping a gallon of HOT water into the unit. I could not be happier. It was easy to clean afterwards. I would highly recommend this piece of equipment. GREAT PRICE AND VALUE!!! 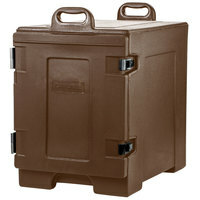 Great product to transport food in and when I was ready the food was still hot. I really enjoyed this product and will buy another one soon since business has increased. I purchased this item last year for schlepping hot food to pop-up markets in the city. I love, love, love it and can't live without it. I can't imagine how I ever worked without this before. I get 5 21/2" pans in and lock the door. This unit keeps everything hot for about 6 - 8 hours. I prep the unit with a tray of boiling water before I use it and that really makes a difference. Thank you - will definitely buy again as my business grows. Thank, thank you. 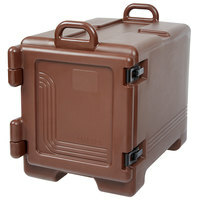 This food pan carrier works well for my catering business. I will be ordering more. It is easy to carry and transport. I think these are amazing food carriers. I dont only use them for keeping food hot but for keeping it chilled. We load them with chillled product and place them out with the grill so people can order while on the course. I love my Carlisle food transporters! I have purchased 2 of these (so far) and use them constantly. Seal is still good, easy to clean, sturdy hardware and great colors too! Works very well for cold food without using ice. Keeps food within safe temp for up to 4 hours. Great for events where guests will not eat for a few hours after our arrival. This is an Awesome Pan carrier, We use it on all catering jobs - if you pre-heat it , it will hold food at great tempature for well over 6 hours, and it will still be smokin hot !!!!!! Very Happy with these carriers. We own four of them. Very durable, well made, and serve many purposes for hot or cold foods. Love how it allows for several sizes of food pans. 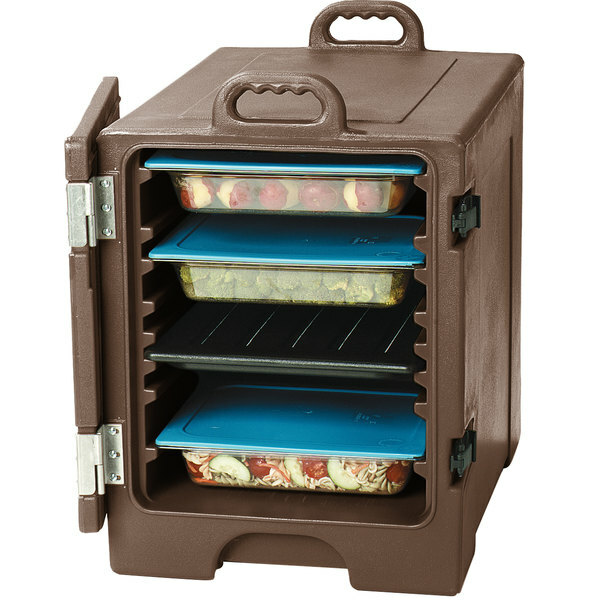 Iam a small time cater that was looking to find a product that was easy to tranport from place to place.I would recommend this item very highly it's keeps the everything in place and food stays warm. We own 8 of these. 2 are gray which are used for salad related items. They hold everything hot or cold. We use one to hold, distribute and store our utensils. They work with most metal food pans (check them before you buy pans) but are designed for the Carlisle Top Notch food pans although other companies will work in them as well. Use quality gaffers tape (it's like duct tape only it is cloth based with better quality adhesive) place it on the front door and mark the contents. They are a God send for caterers. I cannot say enough on how good the carrier is. I use it for BBQ catering to put boston butts in when they come off the smoker. This is a must have and you can't go wrong investing in one of these. My set of these boxes do a great job of keeping food hot or cold. It helps if they're prepped with hot or ice water. 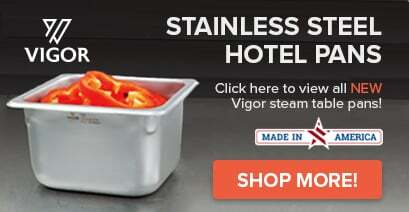 They can hold either hotel or half-sheet pans. I get different colors so I can send to different areas during an event. I wish they were a little lighter, though. Loaded, they require 2 people to move or use of a dolly. I started a catering business and had never used one of these before. The first time I used this I was totally amazed on how well it holds in the heat. I used it for an out of state dinner and was delayed 6 hours in a snow storm. When I finally removed the food from the carrier, it was still so hot we could not eat it! Definitely get one of these! I really like this box. I do BBQ contests and cater some and it works great. It will hold 2 six inch deep pans and one 4 inch deep pan all at the same time. Which means that I can fit a ton of butts in it and keep them piping hot for hours. I love my Carlisle. It keeps foods hot or cold. It is easy to move around and a must if you do a lot of cooking. I am not sure how I lived without this carrier for so long... It keeps the food nice and hot during transport and saves tons of room in my vehicle.